This card may not be exchanged for cash. This card is not a cheque guarantee, credit, debit or charge card. We will not be held liable for lost or stolen cards - protect this as you would cash. To check the balance of your giftcard please visit www.allbarone.co.uk/giftcards A gift card is valid for 12 months from the date of purchase. This card is valid for use at All Bar One Bars only. Gift cards can be purchased with a minimum value of £5, up to a maximum of £100 in £5 denominations. SMS and email gift cards should be treated as cash. If deleted they will not be resent. Any remaining balance will be provided as another email or SMS sent to the guest. SMS gift cards will be free to receive for the guest. Email gifts are valid either presented on a smart phone or printed out. All SMS and email gift codes are unique, and cannot be used more than once - any remaining balance will be reissued in a new email or SMS. We reserve the right to amend the terms and conditions. Further terms and conditions are available upon request. 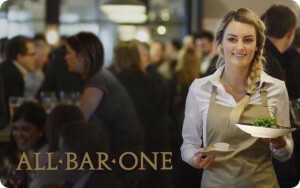 For stylish city dwellers, All Bar One provides the ultimate setting for a relaxed drink, a casual meal or a big celebration. The food is classy and the cocktail menu is inviting – so for anyone living in the city, an All Bar One gift card is a ticket to their ideal meeting spot. Whether they want to treat a group of friends to a round, or sit down to a quiet meal for two, their All Bar One gift voucher is theirs to spend any way they like. Each of the lively bar locations are popular amongst young couples, work colleagues and professionals looking for a chance to unwind. So why not send someone a gift they can use in a bar they love, where any occasion becomes a special celebration! This gift card is valid for use at All Bar One restaurants only. Email gifts are valid either presented on a smart phone or printed-out.